It was starting to look like I should bag this whole race idea and go home. My plan was to leave the house by 6:30 a.m. to get to the race by 8 a.m. leaving me time to pre-ride the course before the 9 a.m. start. 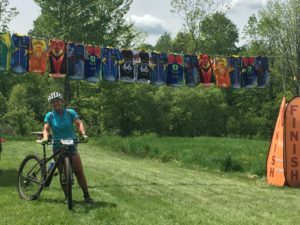 It was only 37 miles of back roads from my house in Lincoln, to Bradford, VT. Two years ago I did my first time race at Coyote Hill Mountain Bike Camps, so I was a little familiar with where I was going and what the course would be like. But, I left the house at 6:45. About half way there I opened my phone to confirm directions only to find that there was no reception. I had to wing it. Eventually I discovered I went 13 miles out of my way. Now I was late and I really needed to use the bathroom. At 8:30 a.m. I parked on the side of the little dirt road along with all the other vehicles. First, the bathroom, a single port-a-potty. A small line to wait in. I resolved that there would be no time to pre-ride a loop of the course. My main aim of attending this race was to get some steady miles on the mountain bike, a marked course, and some new terrain. That plan was slipping away with the ticking of the clock. At the registration table I see that the category 1 event is at 9:30, not 9 a.m. and they do one loop or 6 miles of the course. Then the cat 2 group starts at 11 a.m. and does 2 loops or 12 miles. Shoot! Do I sign-up for the 9:30 cat 1 event and only do one loop? Or wait until 11 a.m. and get in two loops which also leaves me time to pre-ride the course for a total of 18 miles of mountain biking? Hmm. Nutrition was a consideration. Time was a consideration- I won’t get home until 4 p.m. because I also wanted to run one loop of the course off the bike as well.Â Ugh. What to do? Maybe I should just skip this whole thing and go home. At first, I decide to do the cat 1 race. Then I kick the dirt a few times before changing my mind and switch to the cat 2. By 8:50 a.m. I head out for a pre-ride of the course. At what feels like should be the half-way point on the course I look at my watch to see I have only gone 1.5 miles. “Oh, man how am I ever going to do two loops!” Plus, in all my conjecturing I neglect to get water for the ride. “This is not falling into place so well”, I think. As I ride I keep tallying and adding to the challenges I am facing. Given the extra time in the delay of the start of my race, nutrition and hydration are a consideration, but I feel I can be okay. I plot and plan how I can pull this off-I have a p-butter, banana, honey sandwich, meant for post-race recovery, in the car which I can eat after the pre-ride. There is time to rest and stretch a little before my race starts. And I have enough nutrition in the camelback to get through the race. Given my history of racing and food in the past, I want to check-in to be certain I am not acting in an abusive manner vs hanging tough to get through a temporary challenge. I check in with my body- I am doing okay. After the race, after the run, I will follow-up with some good recovery for this body and all I will put it through, all that I will ask of it, today. Finishing the pre-ride feeling rather strong in a little over an hour. I get some water and dine on my sandwich. Another 45 minutes until the start of my event. I watch the cat 1 racers finish. It takes the first place finisher 47 minutes to come in. I think I can do each loop in race mode in 60 minutes. As I sit, resting and watch, self-doubt begins to creep in. It is familiar, but the thoughts have changed. I used to think I was too fat to do this, not trained enough, afraid of failing and so on. Now my self-doubt sounded like: What am I doing here? Who do I think I am that I can do two loops? Maybe I should have stuck with cat 1? What if I am the only woman? I am over 50 years old, what makes me think I can do this? They will be waiting forever for me to finish. The fast guys are going to lap me, I will be in their way!” Oh my god. I hear all this, I practice being calm. I don’t listen. Another woman strikes up a conversation with me, she too is doing the race. As we chat, we realize we know one another from a previous time and place. I feel better, and at the same time silly for all my previous thoughts. 10:50 comes and we start to line up. Women go last. There are 4 of us. The gun goes off, the 3 women rush off, I am last. I have one gear, slow and steady. For the next two hours I am talking to myself. Self-doubt is gone. I need to focus on what I am doing or I will be crashing into a tree. My attention is on and off, but mostly on what I am doing. I am in the moment. Pace myself, drink. Relax, stay calm. Pedal, pedal, pedal! Just keep pedaling. Make the bike part of my body. Soften the shoulders. And so on. I ride steady and calm. What’s most important, to me, is to ride the course, not fall off and push the bike. From experience, I know if I hurry I get frantic and ride sloppy. Each time I feel my shoulders up around my ears, I soften them. By the end of the first lap, I am in first place. For the next three miles I bounce between hurry/frantic to fast but calm, because the second place women is just behind me. I resist the need to put distance between us and just ride, steady, calm fast and focused. Eventually she is not there. I cannot see her nor hear her behind me. My focus is the same to the finish. I ride steady, fast, calm, and focused. I win. It’s not the race. It is the Voice aka the beast. The voice of self-doubt in this race or grandiosity in others. Racing is 90% mental. This is an example of what that is referring to. This is what we come for. We come to a race to move beyond the Voice. Winning is second, wrestling the Voice is first. Many of the races I have done offer pure maple syrup as a prize. It didn’t occur to me at the start of this race that I would be in the syrup today. But I was. Of course, it is about the syrup-yum!, but it is not about the syrup. It is about the Voice before, during, and after the event. After the race, the Voice continues regardless of the results. After the race, the Voice can then go on and on about how you should have done more, pushed harder. Or it offers excuses, such as not enough sleep, poor nutrition, some rider got in the way, etc. Or the other way such as -you did great, you are the greatest, you are special, better than everyone else! None of these are true-but a sign of illusion- about the little me or big me ego. After the race, can you live with the outcome as it is. What does your voice say? For years I would beat myself up post-race because of what I didn’t do. It was a very loud voice. Nothing I did during the race was right nor good enough. Even when I won the race. Whether I won or not, I felt I could have done better, I felt I didn’t deserve it, or it suddenly became unimportant or there wasn’t much competition or…something. I had excuses, too. I feared not being able to do it again. It was how I defined myself. There was constant judging. I thought I was alone in this, but it looks like just about everyone does it. Professionals to age group athletes. It’s the inside work that gets us, challenges us. We think we are alone, we are embarrassed, ashamed. It’s uncomfortable-we feel vulnerable to acknowledge it. Friending our own personal beast is the way out. Or the way in. The outward physical training-the content- is easy, the inward work-the structure- is challenging, yet freeing. My Voice is still there, softer and more subdued. Quieter. And yet, it is what we come for. This wrestling is why we do it. It can awaken us. If we pay attention. The syrup doesn’t have to be the actual syrup, but more a metaphorical syrup. How we feel in the body-strong, fit, tired from the effort yet alive in the body. Having wrestled with the voice of self-doubt to the truth of who we are. Pure potential. Pure Sweetness! It is over. The race is done. What is left is merely a dream left to our own interpretation in that moment. After my run I am so muddy, tired, hungry and salty. Spent. I feel amazing.